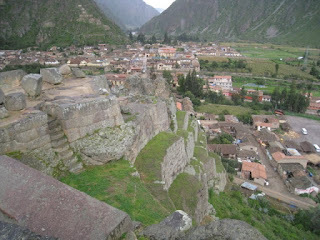 We caught a couple of busses out of town this week and headed for the small town of Ollantaytambo for a night. It was well worth the journey! The bus ride snaked it´s way through what is known to Ancient Incans, Locals, and tourists alike as ¨The Sacred Valley¨. 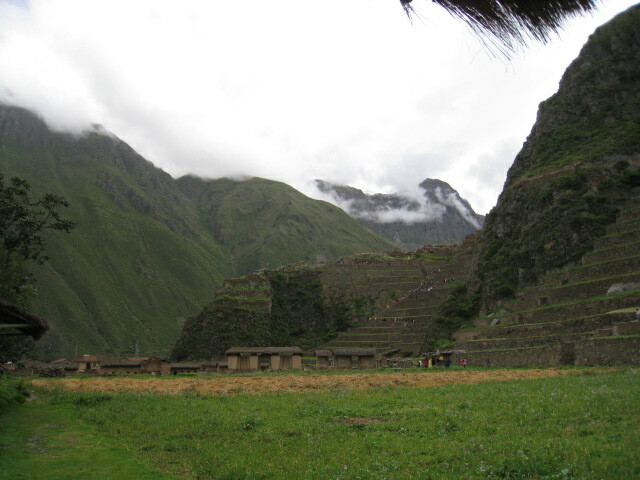 This is the valley where Machu Picchu and a whole host of other very interesting Ican cities were (and still are) located. It´s quite lush, a little warmer than Cusco and at times dryer. Cusco and this valley are considered the heart of the Incan empire and the whole place is littered with ruin sites and towns that still boast buildings, aquaducts, and walls of Incan heritage, probably a few people too. The river Urubamba lays at it´s bottom and it´s this river that is responsible for raging over the rails and washing out all access to Machu Picchu. While this is lame, there are tons of other places to go here. Ollantaytambo was particularly interesting because the town itself is a former Incan settlement so the walls of many buildings and carless streets and aquaducts which guide a small stream throughout it´s fields and streets are all very very old. And as we have learned from places like Rome, Cairo, Bethlehem, etc... Old is good. Old is interesting. These cities are some of North Americas oldest continuously inhabited settlements and if you were as lucky as we were to settle there ourselves for a night, you´d know why. 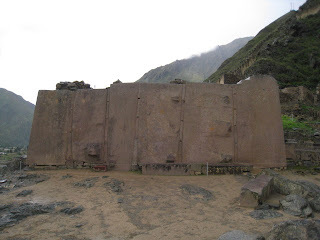 Ollantaytambo is a stunning little place at the juncture of two very deep valleys and surrounded by dryish peaks with a giant Incan Fortification/Ceremonial centre stepping it´s way up the mountainside. It´s been raining pretty much every day since we got here, but it usually peters out and gets sunny by 10am, this day was drizzly though and while I was warm in my new alpaca sweater, we got soaked. It sure was fun though. It took us a few hours to exhaust this site and the next day we went up the other side of the river, where there are non-paying unregulated ruins as well. Check these out! 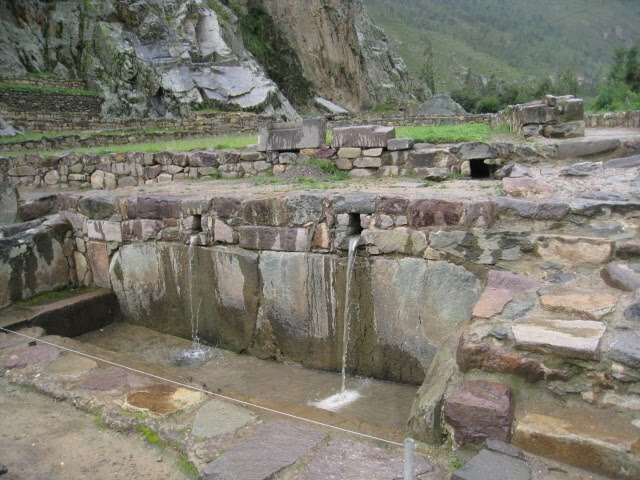 Incan water fountains, that still work. 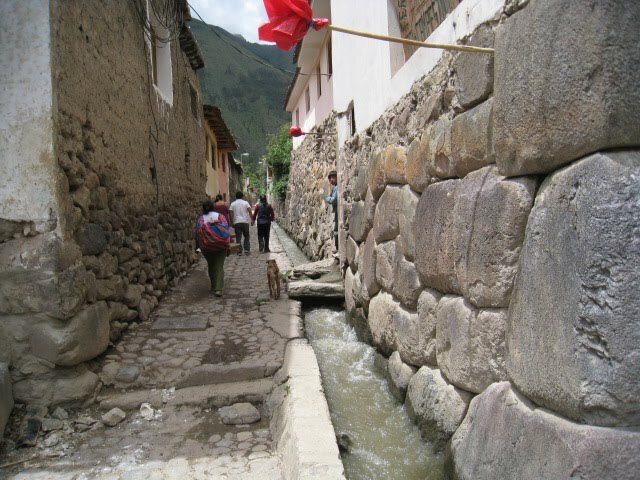 The whole area was crisscrossed with these little ingenious channels that I guess were the way that incans transported water around the area. This is apparently a fort where occured one of the few succesful battles the Incans had against the Spanish. 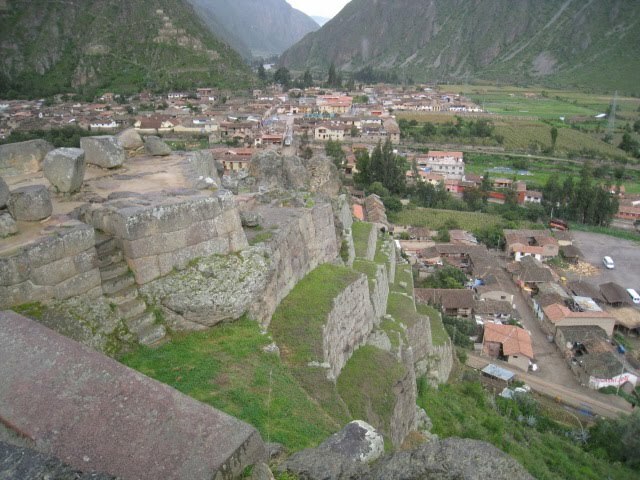 They held them off here on these battlements after retreating from Cusco. Crazy times. It´s hard to imagine rocks, arrows, and spears being chucked off these terraces at armoured spanish horsemen, but that´s what happened. The vegetation up here on these dry mountainsides was practically as interesting as the fortress itself. 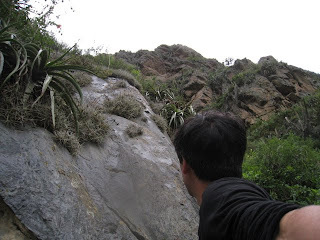 Because it´s the rainy season the mountainsides were lush with undergrowth. Cacti, Maguey, crazy looking air plants, and wild flowers of many varieties were in full bloom. This little town was really looking quite slow. There was evidence of some washout from the extreme rains and the river was swollen and roaring with debris and the color of chocolate milk, pretty dangerous looking. However, people here seemed to be carrying on as usual. The bridge to the ruins had been repaired and only really noticeable thing was the emptyness of all the businesses in town. Practically every restaurant we´ve been in, we´ve been the only people. 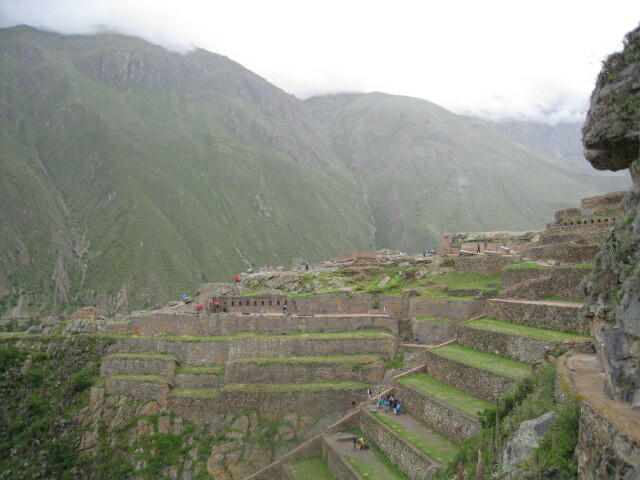 And that goes for Cusco as well. It seems the dropoff in tourism from Machu Picchu´s closing and the sensationalist articles in newpapers may hurt the region more than any natural disasters. It´s been a bit wet and muddy from place to place, but nothing like we expected from reading the papers on the coast. The obsession with Machu Picchu is funny actually. These ruins offered a practically parallel experience from my standpoint. Points of interest for tourists become like pilgrimages over time and people can become a bit crazy I think. It´s like waiting for hours in the rain to catch a glimpse of your favourite movie star. Nonetheless, this place warrants a visit. I suggest staying a few days and chilling-out and walking the hills to some other more remote sites around here that I read about but didn´t get to. The people in this small place are friendly and there is pretty much everything here a vacationer could want. These giant stones were under construction when the Spaniards came and destroyed everything. They were quarried from a site about 5kms away! 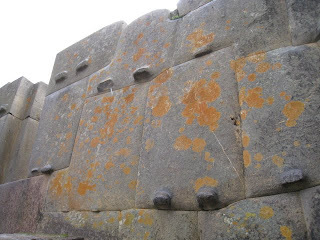 I can´t imagine how much work that would have been, but I guess as we have learned from other civilizations in those times, rock hauling was a serious priority and when you´re a king, it´s never hard to find haulers. 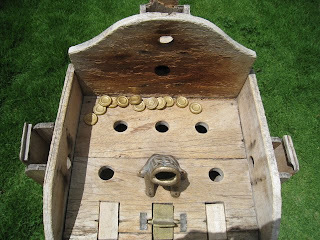 This was a Sapo (frog) game that they had at our hostel and it´s aparantly a popular Peruvian pastime. 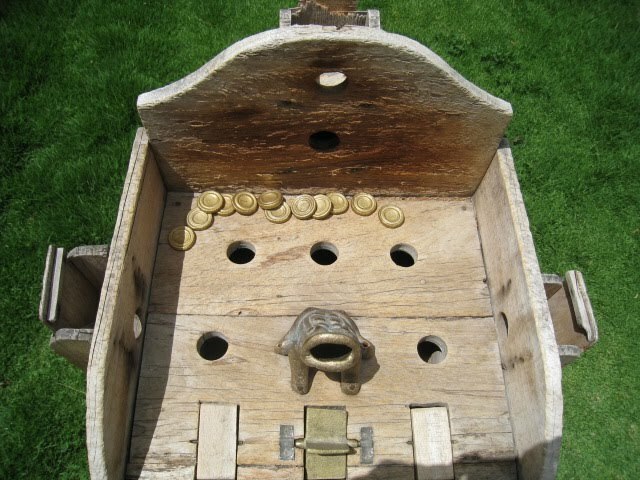 People throw brass coins and try to score points in certain holes with the top score being in the frogs mouth. 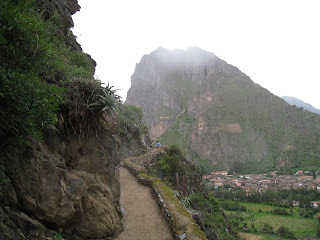 This is what the ¨streets¨ of Ollantaytambo are like. I don´t think they´ve changed much since the olden times, but when we hiked up the hills and past some terraced gardens you could see over the high walls into peoples little yards and houses. Some were quite old-fashioned with hog-wallows, veggie plots and chicken coops while others had manicured flower gardens. I felt like I was looking down on some old-world europe village. what a great blog. inspired me to make-boy. one about our recent trip to Oaxaca as it reminded me of it. Was sad that i did not see enough of your mom--she'll be back in april so will we. look for my blog. i'll let you know when.